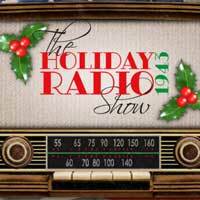 Three Cat Production is thrilled to bring back its hit show, The Holiday Radio Show: 1943. The Holiday Radio Show takes us back to Christmas 1943, featuring stories by Louisa May Alcott, Lucy Maud Montgomery, O. Henry, Langston Hughes and more. There will be drama, wacky humor, adorable actors, and some truly transcendent three-part harmony that will chase away your "I Can't Believe It's the Holidays Again" blues. "...The chief complaint of most Scrooges (myself included) this time of year is that Christmas music starts too early and by the time Christmas actually rolls around, if you hear another word about that little boy or his freaking drum, you’ll scream. So do yourself a favor, and get this version of them stuck in your head. Seeing this show was like slipping under a favorite blanket, warm and familiar — exactly what a holiday show is supposed to be. On the strength of a talented cast, this was a charming start to my holiday season."